Our goal is to provide golfers of all levels with equipment to improve their game and maximize their capability and agility. The approach we take is simple, yet innovative: Combine creativity, practicality and hard data to empower you to improve your handicap and enjoy the game as never before. 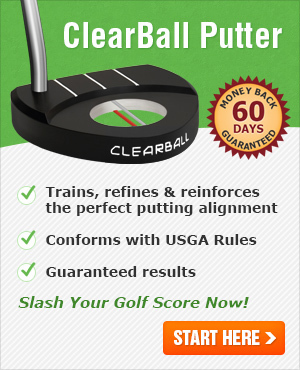 Our flagship product, the ClearBall putter was developed by analysing the putting technique of top PGA and LPGA players and making a comparison to non-professional golfers. We quickly found that the elite players distinguished themselves from the field with consistent and accurate alignment. This discovery led to the idea of creating a putter that would give immediate feedback to golfers and guide them to correct their stance for the perfect alignment. After hundreds of hours drawing, designing, fabricating, testing and refining the ClearBall putter, we introduced the first retail series in Washington State and British Columbia golf clubs during the summer of 2011. More importantly, we have received consistantly positive feedback from golfers of all type - female, male, amateur and Tour Pros as well as golf legends such as Doug Sanders and Bruce Fleisher.